"This is a very old-fashioned recipe. 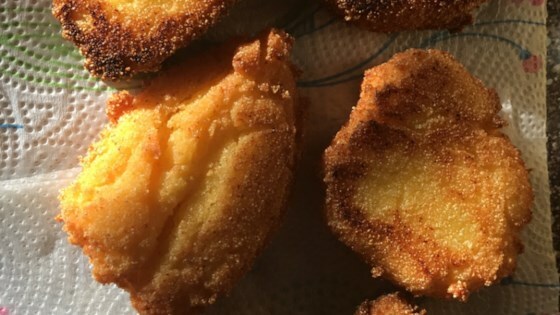 The cornbread is shaped into little cakes and fried, rather than baked. They are served with maple syrup or honey." In a medium bowl, combine cornmeal, salt, and sugar. Add boiling water and shortening; stir until shortening melts. Pour oil or bacon fat to a depth of 1/2 inch in a large skillet and heat to 375 degrees F (190 degrees C). Shape cornmeal mixture into flattened balls using a heaping tablespoon as a measuring guide. Fry each in hot oil, turning once, until crisp and golden brown, about 5 minutes. Drain on paper towels. Serve at once with maple syrup or honey. You can use bacon grease in place of the shortening, if desired.